Big Brother Naija 2018 first runner up, Cynthia Nwadiora popularly known as Cee-C writes to her sister and wants to appreciate her for being a powerful force in her life, especially in the year 2018. 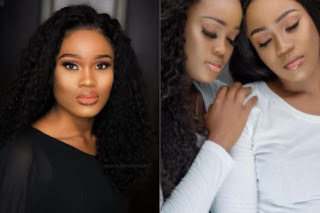 In an emotional note she posted on her social media, Cee-C appreciated all members of her family, followers and team and wish for them the best in the new year 2019. Hello loves , forgive me for being scarce lately ; I decided to take a little break off social media to just reflect , relax and spend time with family. 2018 was life changing for me , it came with many highs and lows , wins and losses but it was all worth it . All my life, my sister together with the rest of my family has always watched over me but this past year she recruited thousands more for my sake, she fought tooth and nail and protected me at all costs even when i didn’t deserve it . @lusciousbella , thank you for helping rewrite my story, thank you for this amazing army you raised and thank you for being not just my sister but my rock. You made my 2018 unforgettable. I really dont know how i can repay my sister or my spartans for how amazing they made my 2018 but until I figure that out , I pray that through my work, i can continue to pay it forward.